As one of the first products manufactured by the Latham family company back in the 1960’s, the Neoprene-X-Pansion Loc Strip Control Joint & Neoprene-X-Pansion Tile Strip Systems remain the industry leader for floor control strips in Australian construction. 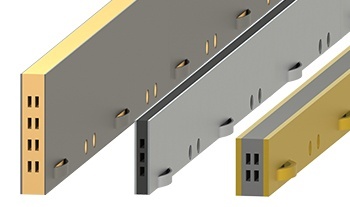 In 50 years, no other manufacturer has been able to replicate the process that Latham has developed to create a completely secure bonding of the neoprene insert to the metal side plates that our floor control strips provide. 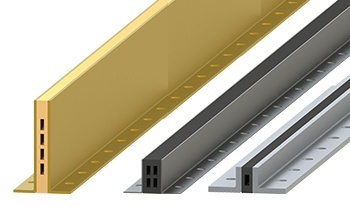 Another reason our floor control strips differ from the products our competitors offer is that we pay particular attention to the quality, straightness, and uniformity of the specialised neoprene extrusion. This is vital to accommodating thermal movement within the flooring system without compromising its structural integrity. 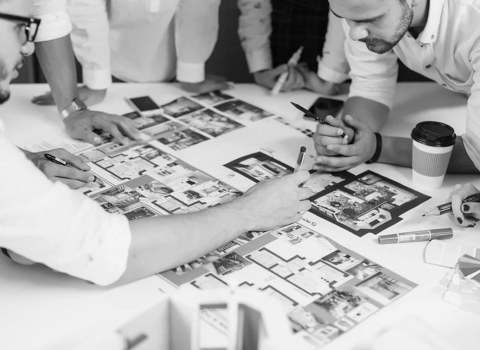 Unfortunately, many other manufacturers skip this step to make construction cheaper but at Latham, cutting costs at the risk of lowering quality standards is never an option. What Are Neoprene-X-Pansion Loc & Tile Strips Used For? 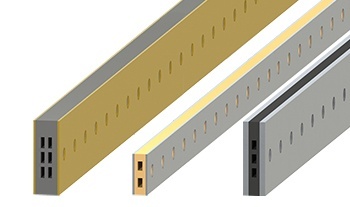 Also known as Latham strips, control strips, isolation joints, or movement joints, Neoprene-X-Pansion Loc, Tile and Dividing Strip systems are designed to manage thermal expansion and contraction in constructed surfaces. They are especially well suited to installation in ornamental or architectural hard paving. They can also be used in stone, tile, terrazzo or virtually any other solid floor finish that requires movement control due to thermal contraction and expansion. They also serve to absorb climate-related tile and paving growth and minimise erosion and cracking to surface paving. Loc strips are manufactured for use in sand cement bed underlay, where the surface flooring finish will be installed onto the wet cement bed. They can be used for both internal and external applications. In external areas where increased movement and temperature change can be expected, a combination of wider neoprene control strips and reduced flooring component sizes should be considered. Tile Strips on the other hand are designed for use in all adhesive fixed hard flooring applications and to be installed in conjunction with the appropriate tile adhesive. 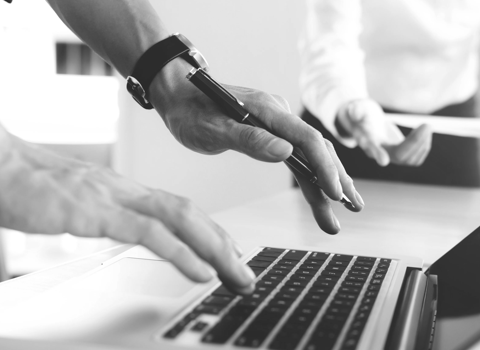 They can be used for both internal and external applications. In external areas where increased movement and temperature changes can be expected, a combination of wider neoprene control strips and reduced flooring component sizes should be considered. Both systems are available in a number of neoprene insert colours and metal side plate combinations including brass, stainless steel, zinc and aluminium. The system allows quick and easy installation as it can be installed at the same time as laying the wet under-bed or adhesive. This ensures positive anchorage and additionally acts as a gauge for the paving thickness. It requires no on-site work other than cutting to length where necessary. The control section is made from only quality neoprene. Air channels are incorporated to allow maximum flexibility for expansion and contraction whilst still maintaining a hard top wearing surface. They are available in black as standard as well as optional buff or grey. 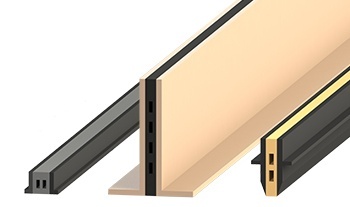 Latham Neoprene-X-Pansion Loc Strips are designed to be used in all hard flooring applications and to be installed in conjunction with wet bedded flooring applications. They are available in a number of neoprene insert colour and metal sideplate combinations including brass, zinc & stainless steel. Latham Neoprene-X-Pansion Tile Strips are designed to be used in all adhesive, fixed hard flooring applications and to be installed in conjuction with an appropriate tile adhesive. They are available in a number of neoprene insert colour and metal sideplate combinations including brass, aluminium & stainless steel. Latham Concrete Topping Through-Bed Neoprene Loc® Strips are designed to be installed in concrete topping applications. 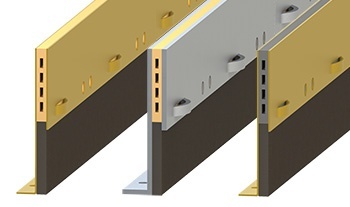 They are manufactured to custom depths with the angle side plates designed to be fixed in place to the structural slab or form work. 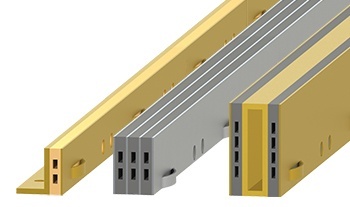 The systems are available in 6mm and 12mm neoprene widths and metal side plates with a thickness of 1mm and 3mm in Brass and Zinc. Latham Neoprene-X-Pansion Through Bed Loc Strips, with closed cell polyethylene tail, are the best method for ensuring that a joint under the Loc Strip is free from debris. The polyethylene tail is designed to go through the bed to the slab. They are designed to be used in all hard flooring applications and installed in conjuction with wet bedded flooring applications. Latham Neoprene-X-Pansion Stress Relieving Control Strips are designed to be used in applications where Latham Neoprene-X-Pansion Loc or tile Strips have been overlooked when the floor finish was previously installed. These control strips are designed to be saw cut into the finished floor to help control expansion in the flooring surface. 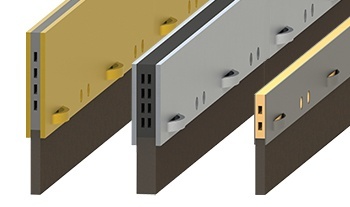 Latham Neoprene-X-Pansion Terrazzo Tiles Strips with 6mm and 12mm neoprene inserts and 1mm Brass or Zinc folded side plates are designed to be used in applications where Terrazzo tiles are being used and are being ground insitu. The strips will accommodate up to 4mm of on-site grinding in the floor grinding application. 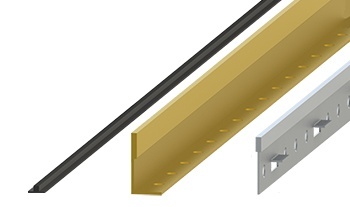 Latham Neoprene-X-Pansion Custom Made Loc Strips are for special applications where a custom installation is required to suit specific conditions. There are a range of custom made configurations available from special effects loc strips to those for use in parquetry floors. 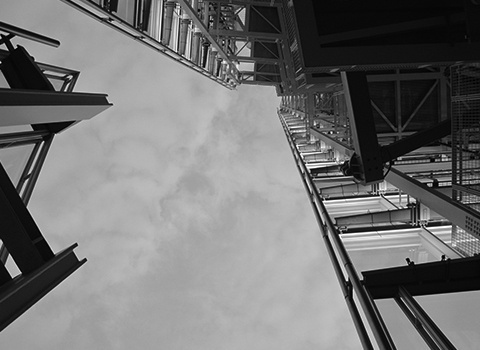 Speak with your Latham technical rep for special applications. Latham Neoprene-X-Pansion Rebonite Loc & Tile Strips are used for special applications, such as hospital operating theatres and munitions works where there is a need for non-static floors. They are also used in exposed aggregate paving for both functional and aesthetic reasons. 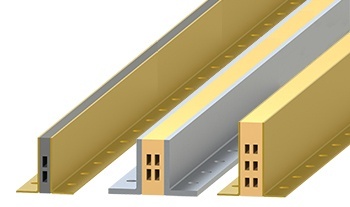 Latham Dividing Strips in brass, zinc and rebonite are in standard 1800mm lengths. The thickness of the standard products has been carefully engineered to maintain even wear with that of the surface of the pavement.